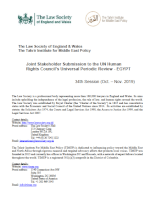 As part of a commitment to producing knowledge and analysis on the policies implicating the rule of law in the Middle East, the Tahrir Institute for Middle East Policy (TIMEP) and the Law Society of England and Wales have submitted a joint stakeholder report ahead of Egypt’s Universal Periodic Review (UPR) third cycle, set to take place in October and November 2019. The UPR is a mechanism of the United Nations created to examine the human rights performance of all U.N. member states. examples of arrest, detention, death in custody, and enforced disappearance of lawyers and human rights defenders. Per the UPR process, the country being reviewed submits a national report and the Office of the U.N. High Commissioner for Human Rights puts together (1) one report compiling U.N. information—including reports by the special procedures and treaty bodies—on the country, as well as a second report compiling information received from stakeholders, including civil society. 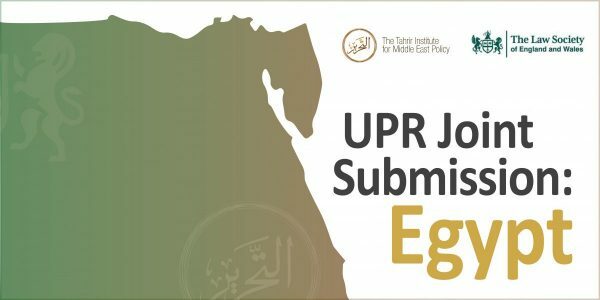 Egypt underwent its first UPR cycle in February 2010 and its second cycle in November 2014.